Bonjour, @DiegosDaughter here! It’s Valentine’s Day, so let’s talk Paris. Every few months I head to the South of France (work perks) and I try to pass through Paree and give it some love. I rarely get more than an afternoon of free time before I have to hop on a plane, and I’m here to tell you that you can do Paris in six hours…and given the chance, you should. So get your walking shoes on cause I’m about to take you on one of my favorite strolls in the city of love. 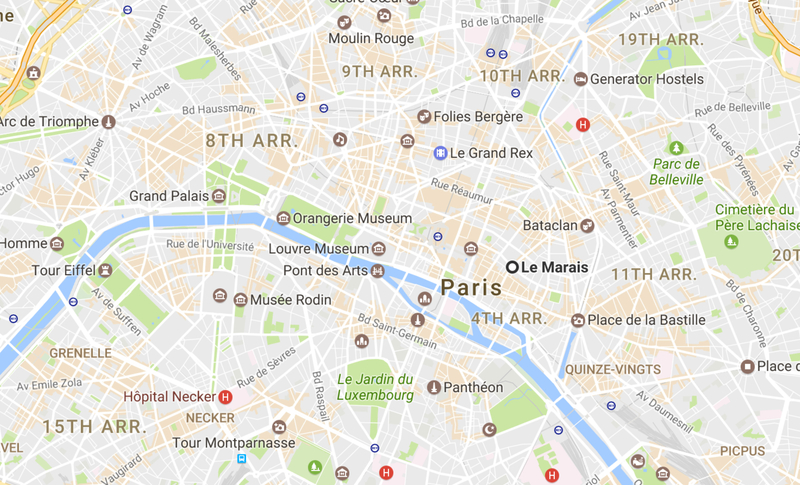 Your starting point: Le Marais, one of Paris’ famed historic districts that sprawls across the 3rd and 4th arrondissements. It’s a living, breathing representation of Old Paris in all its aristocratic splendor. Walk south towards the Seine River on the main streets of Rue Vielle du Temple or Rue des Archives (they run parallel to one another). I prefer Rue du Temple, it’s quainter and quieter. Stop in a patisserie, any patisserie, you literally cannot go wrong. Both Rue Vielle du Temple and Rue des Archives end on the banks of the Seine. Find one of the nearest bridges, Pont Louis Phillippe or Pont Marie, and walk across to Ile St. Louis. Cross over Pont Saint Louis to Ile de la Cité, where the Notre Dame Cathedral proudly stands. Poke your head into this opulent chancel and then wander through the windy cobblestone streets of Ile St. Louis, which is a time travel experience to quintessential Old Paris. Head back across the mainland on Pont Neuf. Quai François Mitterrand is a main street that runs parallel to the Seine. Make a left on this street as you come off the bridge and you’ll sneak up on The Louvre. Dodge the street vendors and walk east through the stunning gardens of Jardin Tuileries. Make your way toward the ferris wheel. Buy a ticket for around 7 euros for the Musee de L’Orangerie, home to Monet’s water lilies which stretch across entire walls and are an absolute must-see. Getting into the Luvre is a veritable circus act, if you ask me, so if you’re going to spend time in any museum I highly recommend this one. It’s smaller, less hectic, and less crowded. So there you have it, the most romantique stroll you’ll ever take, under six hours time.